"Dad, I don't know how to say this. I don't want to drive your car. It's slow, it's ugly, it handles like a shopping cart." "I will not fake rabies"
Saturdays of Thunder is the ninth episode of season 3. 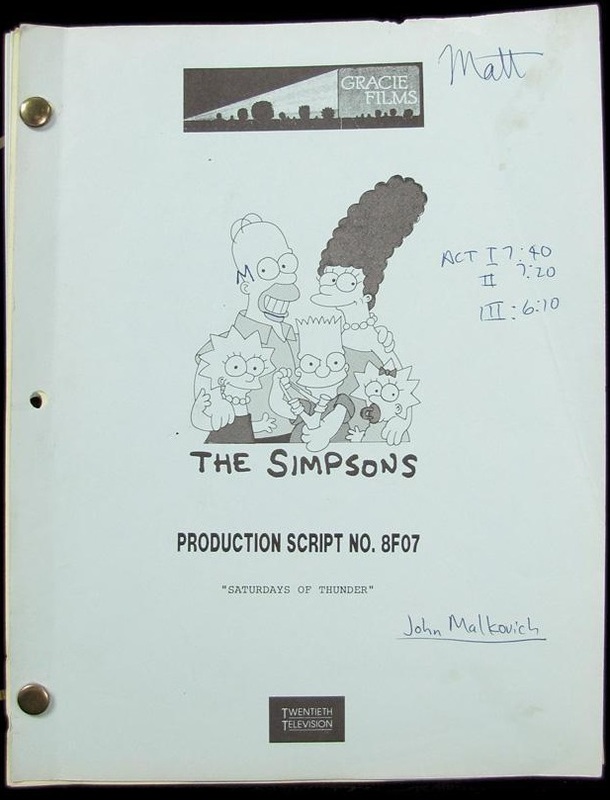 The episode first aired on November 14, 1991. It was written by Ken Levine and David Isaacs and directed by Jim Reardon. It features cultural references to films such as Ben-Hur, Lethal Weapon, and Days of Thunder. "Bart becomes deeply immersed in competitive soapbox racing while Homer begins to realize that he's not as good a father as he thought. 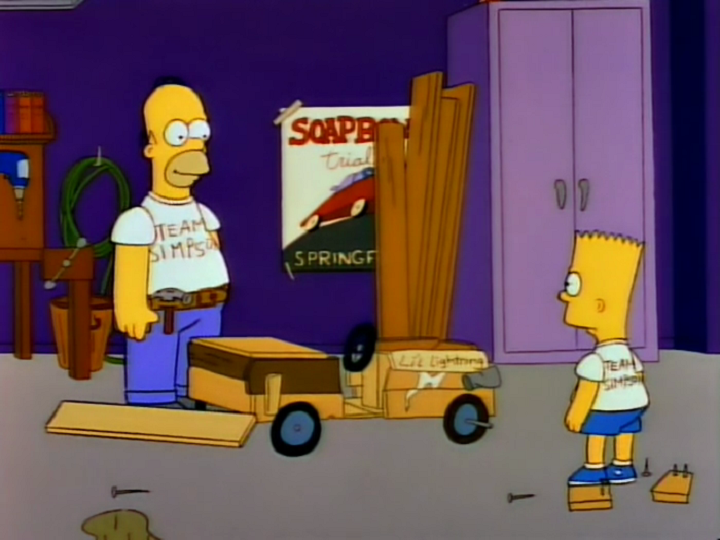 After attending a lecture at National Fatherhood Institute, Homer becomes a more attentive father, helping Bart build the ultimate soapbox racer. But Bart decides not to use it in his big race against Nelson Muntz, instead opting to borrow Martin Prince, Jr.'s scientifically engineered aerodynamic racer." When the local Soap Box Derby is held in Springfield, Bart has his heart set on first prize. But the catch is that he must build his own Soap Box Racer. In the meantime, after taking a fatherhood quiz, Homer discovers he knows next to nothing about his son. He goes to the national fatherhood institution, at the institution they give a book on fatherhood. He offers to help his son by building the racer together, Bart eventually agrees. Unfortunately, Homer's less than adept building skills brings Bart a very shoddy, rickety piece of junk for a racer (named Li'l Lightnin'). This is especially so in comparison to Martin Prince's personally designed and built space shuttle-like racer, Honor Roller. Martin and Bart form an alliance vowing that either must somehow beat bully Nelson Muntz and his very intimidating racer, the Roadkill 2000, armed with every dirty trick in the book. When the race is underway, Bart can barely reach any kind of noticeable speed with Homer's racer. Meanwhile, Martin has difficulty controlling his racer, as it is moving too fast, which eventually causes him to crash. After being injured, Martin finds that he can no longer race and opts for Bart and himself to combine forces by having Bart race Martin's racer over the racer he and Homer built. Bart seeing no other way to win agrees, which breaks Homer's heart. When Bart later apologizes and desires Homer's best wishes, Homer selfishly denounces both Bart and Martin telling Bart to do whatever he wants. Dejected, Bart gets ready to race in the final match with Martin's newly tuned racer. As he does this, Homer thinks to himself about how selfish he's been, realizing he has learnt a lot about his son, he goes straight to the fridge in the kitchen and reads the test that came from the institution, he does the test, and, passes! He rushes off to the race. At the starting line, Homer wishes Bart luck and tells him that no matter how the race ends he'll still be proud of him. The race is tough as Nelson pulls every dirty trick in his arsenal, but eventually through his skill Bart comes out on top and the "team" enjoy their victory. Bart even meets his hero, three time soap box champ Ronnie Beck, who turns out to be a small kid! 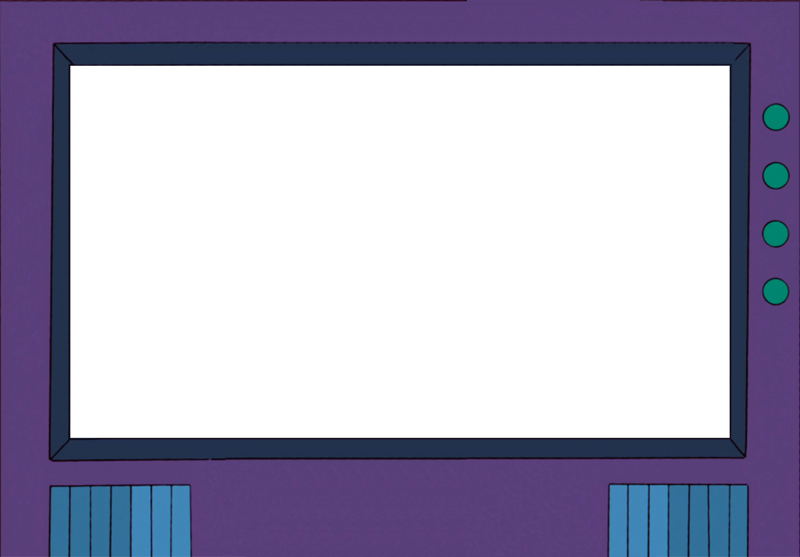 Wikisimpsons has a collection of images related to "Saturdays of Thunder". Modified on August 17, 2016, at 23:33.